What country do you think of when it comes to romance? You didn't choose Ireland, did you? 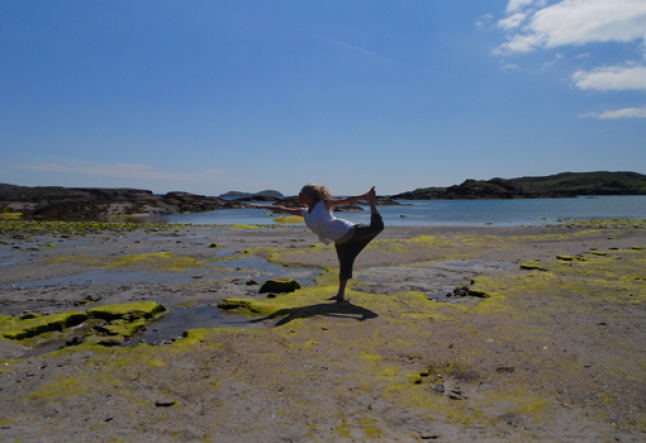 I didn't either but after the Yoga & Cultural Retreat with Irish yogini, Dearbhla Kelly and her kirtan rock star husband, Dave Stringer in Kerry I'm re-evaluating. What I discovered in the southwest part of Ireland is an unbelievable amount of natural beauty. I found myself submerged in enchanted magical, mythical forests where teeny tiny fairy houses bearing gifts decorate selected hidden trees. I sang and danced in a medieval circular stone structure that still stands amongst rolling green hills and herds of sheep. I walked along broad, long white sandy beaches framing Caribbean like blue seas that feed into the warm water of the Atlantic Ocean. Sprinkled along its edges lie electrifying bright green moss, which signifies the purity of the water and somehow celebrates the emerald country's legacy. 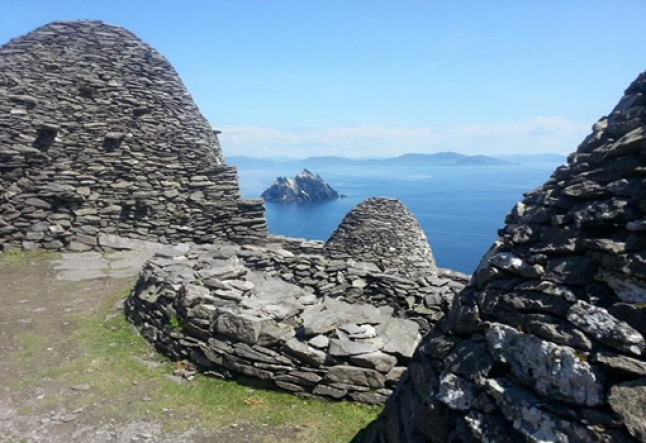 Perhaps one of the most spectacular and spiritual places in all of Ireland I discovered was, Skellig Michael. It is located in the middle of the Atlantic Ocean. An invigorating and adventurous 2 hr. boat ride delivered our group. 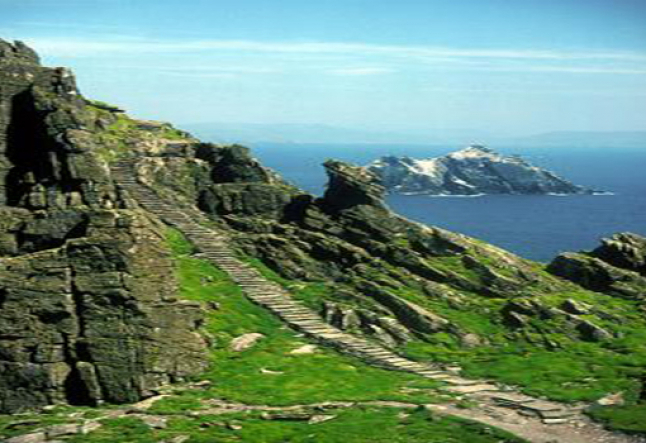 Skellig is a single mountain monastery island founded by Monks between the 6th and 7th century and inhabited by them up until the 12th. They built 6 human sized stone beehive huts on the mountains peak 200 meters above the waves, and, demonstrated a magnificent testament of human faith on earth. 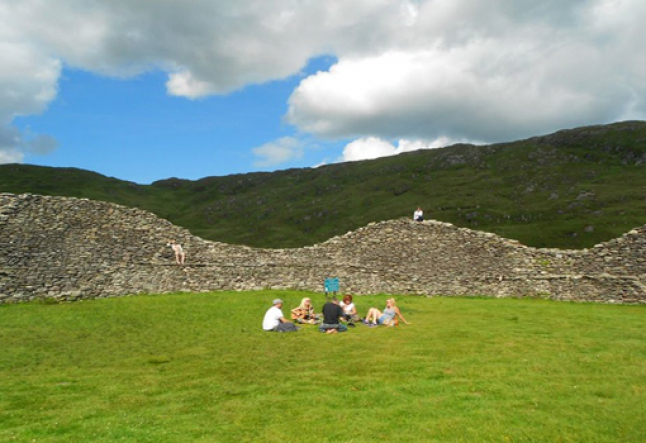 Here they sat surviving the Vikings, political & religious warfare and holding space for Eternal Love. Now the island is a seasonal home for a handful of park rangers and paradise to thousands of puffin birds. The welcomed tourist who ventures to this sacred place and summits the stairway to heaven can soak up its infinite power and majestic views. Despite all the mesmerizing beauty what has truly made me fall in love with Ireland are its people. The wit and humor of the Irish is beyond charming. The pride they hold for their culture, their food, their language, (Gaelic/Irish) their stories and their history is incredibly moving. To hear the Irish speak about it is like hearing a lover describe its beloved. It’s contagious. And of course it would be impossible for me to speak about Ireland without discussing the Music. 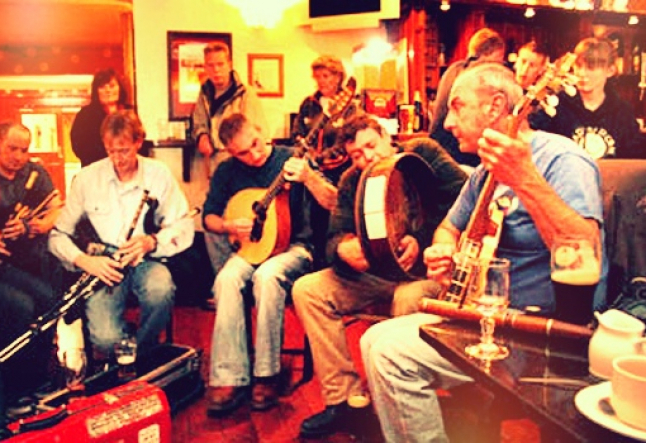 With a cast of indigenous Irish instruments, bodhran, Irish bouzouki, accordion, tin whistle, uilleann pipes, fiddle and guitars the Irish pubs are bumping and pumping with Bhakti. Good ole’ heart-opening traditional Irish music is being offered up everywhere and for everyone. The music cries of gratitude in every note for a culture so rich, creative and juicy. And you don't need a delicious pint of pure Guinness to enjoy it but it doesn't hurt either.